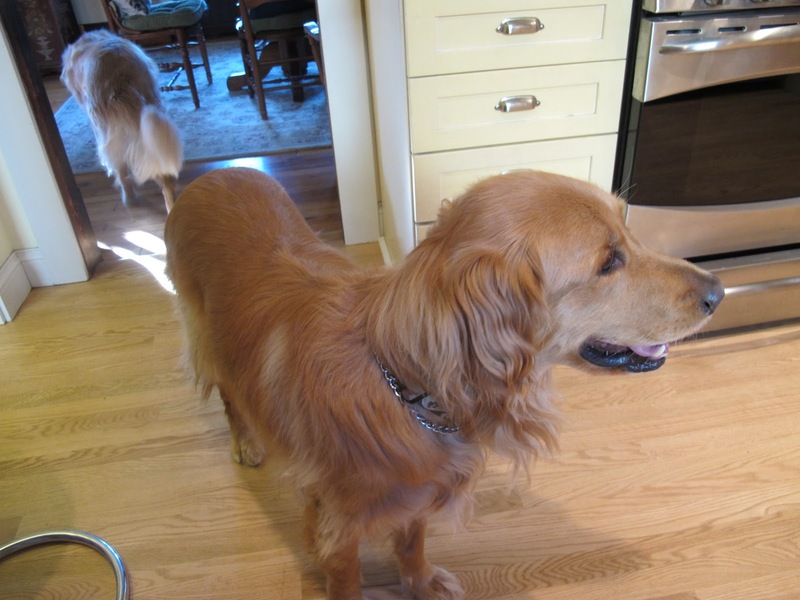 Tucker up front in the kitchen, Gabby retreating into the dining room. So: I leave that shelf open (no mean feat) for all kinds of things I don’t want them to nose into. Such as cheese coming to room temperature. Muffins waiting for breakfast. Unthawing casseroles. There’s one thing about a pie on that shelf, though. It must be on a rack to cool evenly. My rack is large. Sticks out of the shelf. Which was no problem until my arm reached up there to automatically close the cupboard. I almost killed myself ( I have the long scratch and bruise to prove it.) trying to catch that $%f**#@(^& pie before it crashed and burned all over my cement counter. In fact, it happened so swiftly that Bruce Lee couldn’t have managed a save. Alyce hadn’t a prayer. I could have cried; instead I yelled and screamed bringing Dave up out of the family room yelling, screaming (and cursing), too. He didn’t know what happened, but he was getting ready for outrage as he slammed up the stairs. Now the first thing that happens is not the realization that you have time to bake another one. I really didn’t, but would get up very early and manage it. “Dame, get up and bake your pies, bake your pies, bake your pies….” The first thing is pure unadulterated anger. Let’s be honest: I was, in the vernacular, pissed off royally. What the hell was that pie doing smashed on the counter? Pies belong on plates, cut into large, luscious slices or tiny little slivers, depending on who you are. They don’t belong in a big heap crushed and splattered. (Luckily the pie plate was intact.) Dave, on the other hand, calmly crossed the kitchen in one giant leap and returned…. Really good crust, though I like yours better. Just enough sugar and not too much almond extract. Next he claimed a big bowl and scooped it all in as he finally realized he wouldn’t have to share this pie at all. Even if I made another one, this one was all his. And he didn’t care if it was in pieces. Men are not about appearances when it comes to pie. My sister, however, for whom the pie was baked, would have cared a lot. She wanted a whole gorgeous, intact pie; I knew this well. 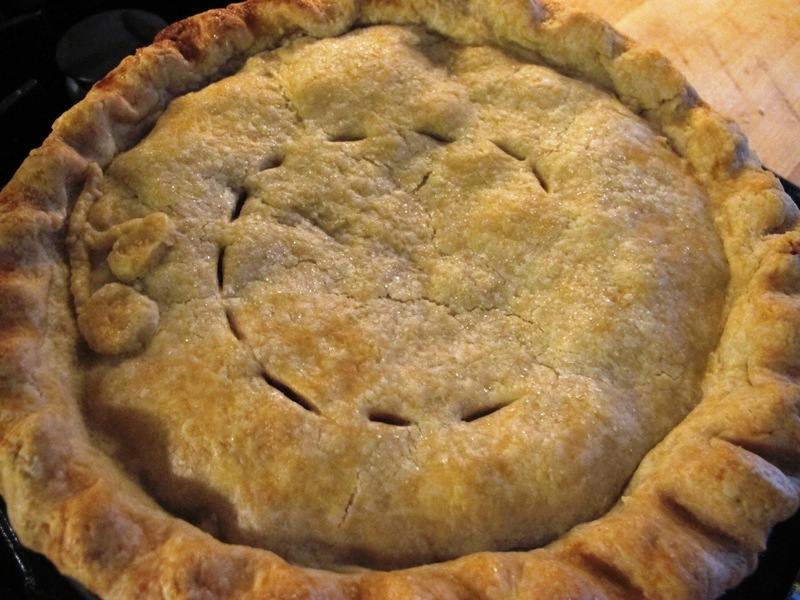 The pie before its fall–made with Dorie Greenspan’s basic crust. 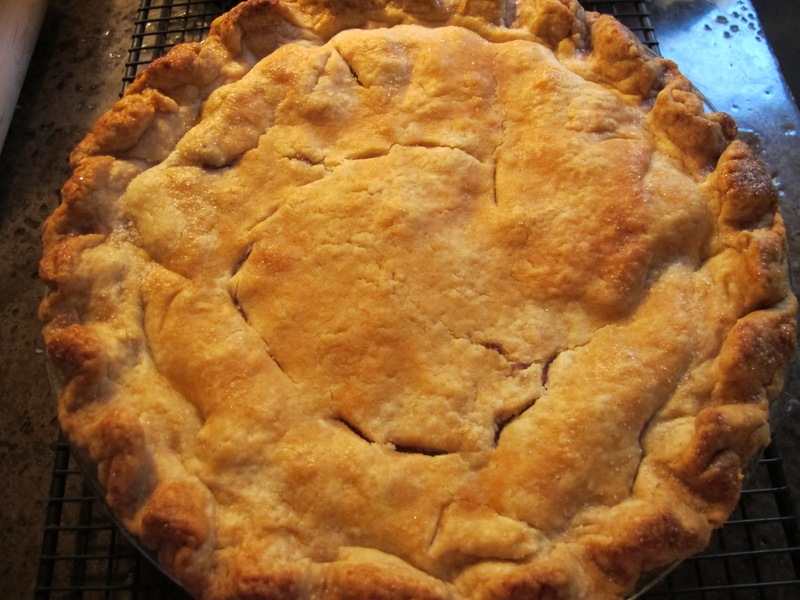 This version made with my all-butter and sugar-free crust, which I decided I liked better. *Place flour, salt, and cold butter in a food processor or regular bowl. Using the steel blade, two knives, a pastry cutter, or your fingertips, cut the butter into the flour and salt until dough is peppered with several different size pieces of fat and flour. *With machine running, or while stirring, pour ice water into dough in a steady stream. Process or stir (you can use your hands, but the warmth isn’t the best thing for pie dough) until the dough just barely comes together. Form into a large ball quickly and cut into two even halves. Wrap each well and refrigerate for 30 minutes. *While dough chills, in a medium bowl stir together all the pie filling ingredients except the two tablespoons of butter. Set aside. *Remove one piece of dough from the refrigerator and roll out between two sheets of waxed paper on a damp counter. Flip dough over, roll pin over once, and carefully, steadily lift paper off circle of dough. *Slip your hands under the paper and, turning the dough over, place it on the pie pan. Again, carefully peel off the paper and by working quickly and gently with your fingers, fit the dough into the pan. Don’t stretch the dough. Leave the excess hanging, patch holes, torn “corners” with extra dough. Trim dough so that you have about one inch of overhang. Pinch or crimp edges. Brush edges of dough with a little of the milk and sprinkle with just a bit of the one tablespoons of sugar. Preheat the oven to 425 degrees Fahrenheit and place rack in the center of the oven. 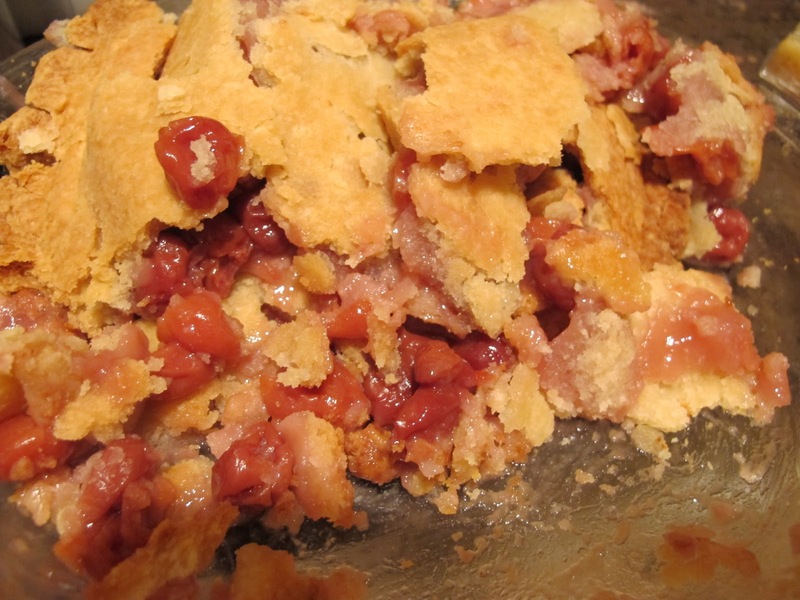 *Spoon cherry filling into the pie and dot with 2 tablespoons of butter cut into bits. *Take second piece of dough out of the refrigerator and repeat the rolling out process. 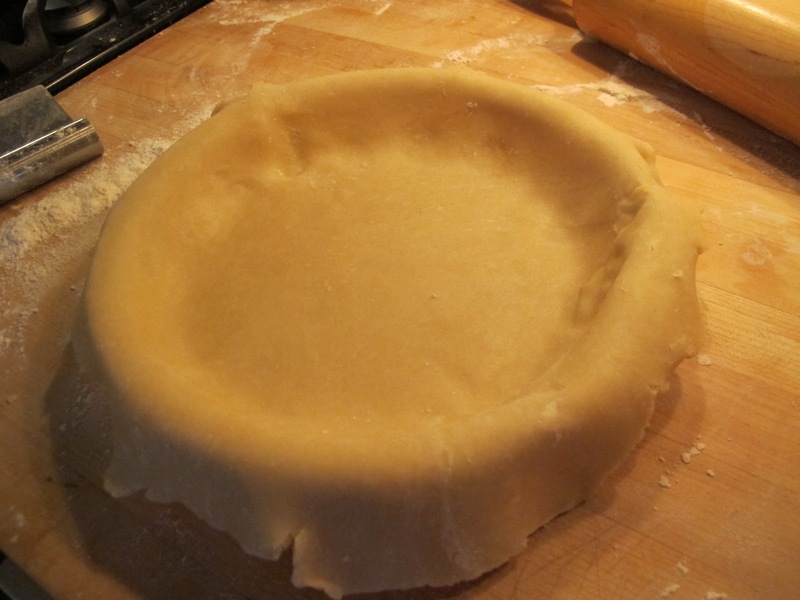 This time, turn the flattened circle of dough upside down (paper side up) onto the waiting, filled pie. Trim overhang to just a bit more than flush with the edge of the pie plate. Press edges of pie together quickly and crimp to seal. 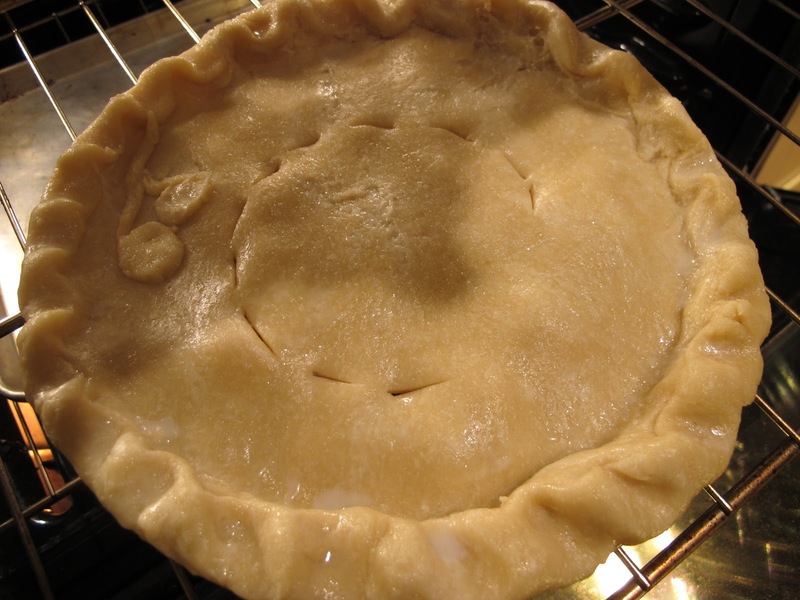 Brush the top of the pie with the rest of the milk and sprinkle evenly with the rest of the tablespoon of sugar. Cut a few vents into the pie top so steam can escape. You can make any designs you want, but you should have at least six half-inch slits evenly spaced. 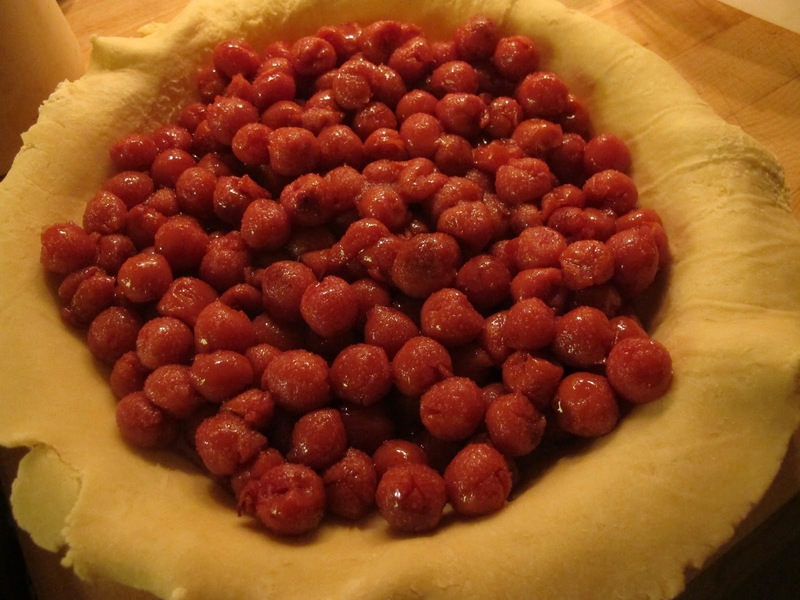 *Place pie on a baking sheet or put a baking sheet on a bottom rack to catch spillovers. Put pie on center rack of preheated oven. Bake 15 minutes. Lower oven temperature to 350 and bake until golden and juices are escaping through the vent slits—about 35 minutes. *Remove pie and cool on rack at least two hours before eating. Don’t cut until just barely warm or totally cool. Can be stored, covered, on countertop 2 days. Refrigerate after that for another two – three days. Wrap well in foil to store in freezer up to six months. Let defrost totally while still wrapped.